As the latest independent builder in Isle Estates, Mustapick Estate Homes has made quite a splash with its three brand-new modelsâthe Southampton, Somerset and St. Croix. Like all of the residences in Old Palm Golf Clubâs lovely Isle Estates, Mustapickâs are distinguished by beautiful coastal architecture, which is reminiscent of the British West Indies. The 4,386-square-feet under-air, one-story Southampton features an alluring Great Room design with four bedrooms, four full and one half bath, a formal dining room and private club room. The modelâs interior is bathed in natural light and offers plenty of uninterrupted views to the outside. For instance, the view from the foyer is across the spacious Great Room out through the covered loggia and on to the swimming pool beyond. The Southampton can be built on any available homesite starting at $2,080,000 and the furnished model is available for $2,645,000. The Somerset also offers a Great Room design and is similarly sized with 4,316 square feet under air. However, the club room is off the foyer instead of a formal dining room, and there is a cabana bath off the larger covered loggia. Other features include four bedrooms, four full and two half baths and a large four-car garage. The one-story model is equally stunning outside, especially at the entryway where a dramatic double fountain greets visitors. The Somerset can be built on any available homesite starting at $2,055,000 and the furnished model is priced atÂ Â $2,795,000. 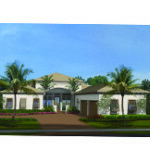 The third model from Mustapick Estate Homes is the one-story St. Croix, the largest of the three. With 4,643 square feet under air, the more traditional St. Croix features four bedrooms, four full and two half baths, a living room, club room, and family room. The extra space is spread throughout the inviting interior, which flows seamlessly from room to room. Like the other two Mustapick models in the Isle Estates, the magnificent St. Croix overlooks Old Palmâs spectacular Raymond Floyd-designed golf course. The St. Croix can be built on any available homesite starting at $2,078,000 and the furnished model is priced at $2,745,000.